Impress your guest's eyes and appetites with these bacon and deviled egg cups. Made by baking the bacon on the bottom of a muffin tin, these bacon cups are filled with a creamy deviled egg purée, made using both the yolk and the white. 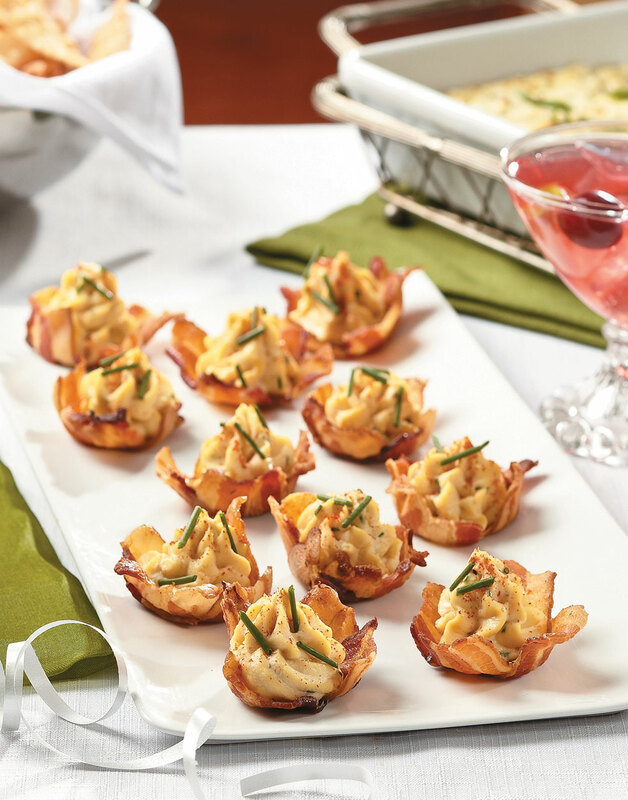 Perfect for your next get together, try making these bacon and deviled egg cups for your hors d'oeuvres. Be sure to thoroughly coat both the muffin pan and the liners with nonstick spray to keep the bacon from sticking to them. Preheat oven to 350°. Invert a 24-cup mini muffin pan on a baking sheet. Coat pan and bottom of a second baking sheet with nonstick spray. For the bacon cups, overlap two bacon pieces (perpendicular to each other) over each cup. Coat bacon with nonstick spray and press a muffin liner over the bacon. Place coated baking sheet, coated side down, on bacon; bake to desired crispness, 1–1½ hours. For the dip, purée eggs, mayonnaise, Dijon, and vinegar in a food processor until smooth; season with salt, black pepper, and cayenne. Transfer dip to a bowl and fold in chives. Chill dip until ready to serve, then pipe into bacon cups. The liners help form the bacon into cups and keep the bacon from sticking to the top baking sheet.